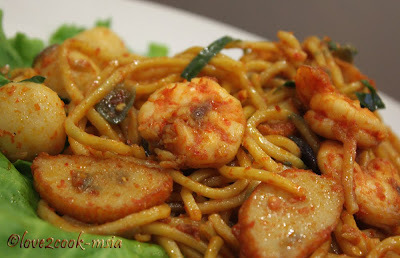 This is another simple yet really spicy fried noodles...I like it this way! So, for those who cannot take spicy foodies, pls reduce the amount of chilli! Heat oil in wok. Saute garlic, shallot and bird's eye chilli. Add prawn, fishball and fishcake. Stir awhile. Add dried chilli paste. Stir for 3 minutes. Add water, soy sauce, sesame oil and salt. Let it boil and add in the noodles together with green mustards. Stir well and cover with lid for 5 minutes under low flame. Stir again, add soy sauce if less salt. Turn off flame. After such a spicy dish, I refreshed myself with Cool Spiced Lassi...! Whisk 200ml low-fat yogurt with 200ml water until well blended. Add finely chopped green chillis (1 nos), shallots (1 nos), dry-roasted cumin seeds (1/3 tsp), chopped corriander leaves (1 tbsp) and a dash of salt. Stir. In a glass, add ice cubes followed by lassi. Serve! 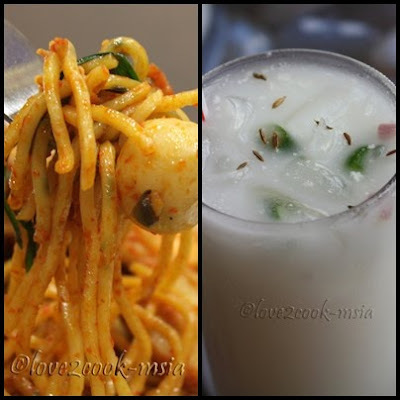 Wow the noodles looks terrific.. wish to have a spoon.. lassi looks super refreshing. MMmmmm, coming there right now for dinner!!!! those delicious hot sea food gooddies on those noodles make me terribly hungry, and only my eyes can see and nothing there for the mouth, this is not fair at all!!! coming to Malaysia tonight!!! and the special lassi must be nice soothing after this hot dish, right? lovely post!!!!!! Those noodles look very tempting and equally tempting is the lassi!! Sushma ~~> Hi Sushma...thanks for the cool comments ya! 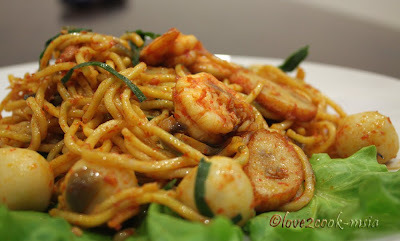 I'd always prefer fried noodles this way...it's terrificly hot...hehehe! Akal's ~~> Hehehe, yeah pls come over!!! U r most invited to join us! So sorry to make U hungry over there! 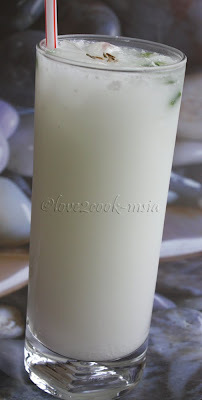 spiced lassi...smthing new!must try it.thanks! Anon ~~> Hi Anon ..aiks, takleh baca ker??? still the same??? Wow.. amazing they look. Hot and cold :) the clicks look perfect. yummmm on the whole. will be back often for sure to see all your delicious dishes. You are most welcome to my blogs too. Do take a peep sometime.